New England tikiphiles have reached the critical mass neccessary to get off their duffs and meet each other. Every once in a while, tiki lovers from an area realize that there are enough of them to meet up in person and enjoy some tiki as a group. New England is following in the footsteps of the now-thriving communities in Southern California, the Bay Area, Seattle, Portland, Florida and Washington D.C., where tikiphiles meet regularly, and many friendships have formed. 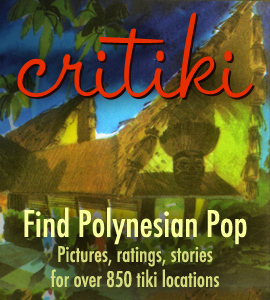 New England has a fair amount of tiki to choose from; the two places that have been considered for a gathering are Hu Ke Lau in Chicopee, MA, and Kowloon in Saugus, MA. A date has not yet been set, but the momentum looks like it will hopefully happen in the next few weeks. If you live in the New England area and are interested in meeting other tikiphiles, be sure to jump right on in — tikiphiles are a notoriously friendly bunch. I’ve been toying with organizing a Minnesota tikiphile gathering but had been putting it off. Your post prompted me to action! I posted a call at Tiki Central Forums – Minnesota Tikiphile Gathering?. Well the first NE gathering is tonight at the Hu Ke Lau in Chicopee, MA. I think at the last count there are 6 or 7 TCers in attendance. Looks like the next gathering will be at the Kowloon in early November. I’ll be back from my tiki trek in CA by then and will most certainly need a fix once back in NE – and the Kowloon looks like a cure. Wow – glad to see the NE gathering has started something over in Minnesota!